The kids eyed up the giant muffin… who was going to get to it first?! If you’re after a super-quick delicious muffin recipe, read on! I just love rhubarb – it’s often forgotten in discussions about great fruit (although strictly speaking, it’s actually a vegetable, but let’s not worry about that), but it’s usually around this time every year, when my mum informs me that her rhubarb patch has gone wild and asks if I’d like some, that I remember just how much I like it. Rhubarb does require quite a lot of sugar to make it palatable, which is a downside, given my efforts to reduce the sugar intake here at OH HQ, but then the tang of rhubarb is an unbeatable flavour, and these muffins offer a delicious and easy way to bake with rhubarb. 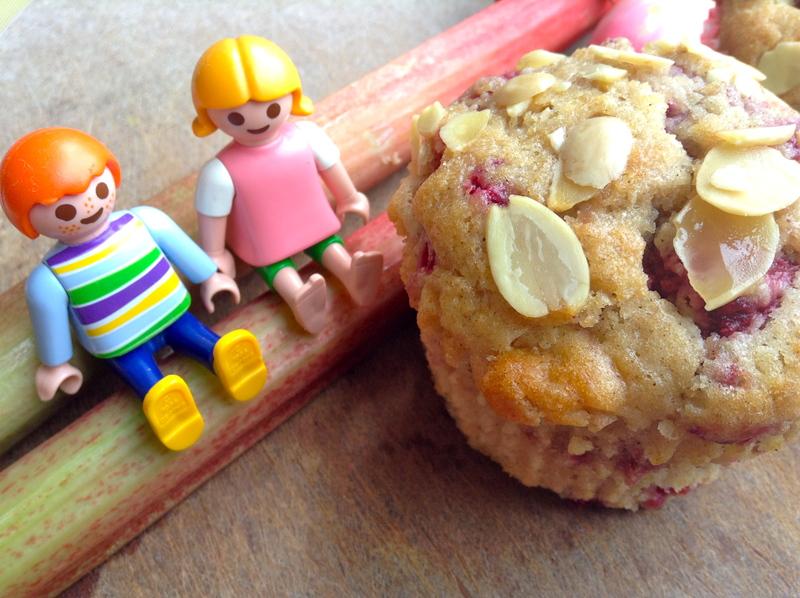 This recipe was inspired by a recent visit to new artisan bakeshop Kitchen in Langport in Somerset, on our half-term travels, where we tasted rhubarb & raspberry muffins for the first time and they were declared ‘delicious’. I hadn’t thought of using rhubarb in muffins before, but it’s great, particularly with raspberries. What’s brilliant is that you don’t need to cook the rhubarb beforehand – you just stir it into your mixture – which means these muffins literally take about 10 minutes to make – perfect for the time-pressed parent. I am into coconut oil at the moment (I use Lucy Bee coconut oil, which I bought in my local health food shop) so I tried it in this recipe and it worked a treat, although you could also use melted butter. These were a complete hit here – both children loved them. They are great for a weekend brunch, an afternoon snack or even in lunchboxes or for a picnic, now the weather’s cheered up a bit! Preheat the oven to 180°C/160°C Fan/350°F, and line your muffin tin with muffin cases. Stir the wet ingredients (melted oil, milk, eggs and vanilla essence) into the dry ingredients and mix, but don’t overmix – lumps are fine. Spoon the mixture into the muffin cases, and sprinkle a little demerara sugar on top of each one for crunch. Finish each muffin with a good sprinkling of flaked almonds. Bake for about 30 mins – test with a skewer – and allow to cool on a wire rack. A few weeks ago I was contacted by a jolly-sounding chap called Giles from Honest Foods asking if I’d like to test-drive their snack delivery service. The idea is they send out monthly ‘Snackoria’ (their word for a box of heavenly snack products) to anywhere that the postie can reach. They use exclusively British produce, trying to give the small producers that they work with a chance. 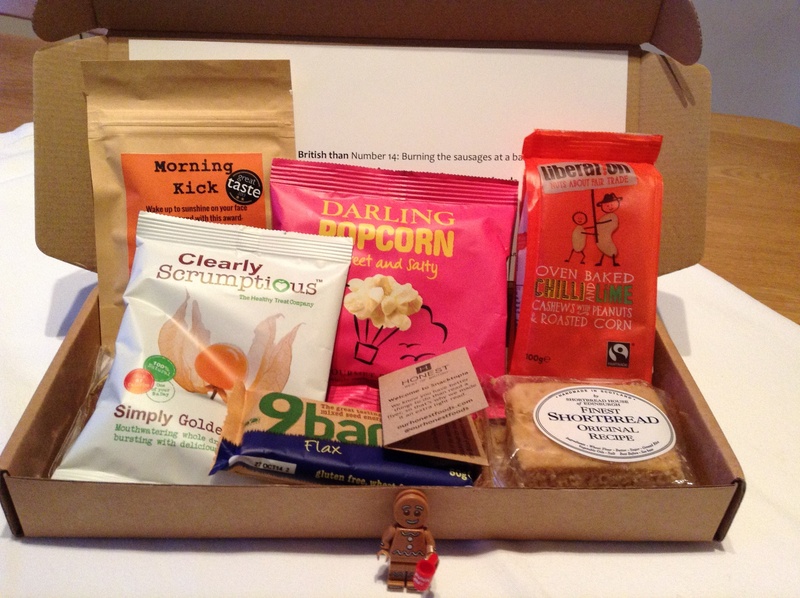 As someone who prides herself on packing snacks for every occasion – my kids are seemingly always ‘huuuungry’ – I was delighted to try the February box. And it contained a rather lovely array of treats, including some lovely popcorn, some delicious chilli & lime baked nuts from Liberation, which is the UK’s only Fairtrade nut supplier, and a 9 Bar (always a winner). I was less keen on the Clearly Scrumptious Simply Golden Berries, which I found too tart, and the shortbread, which was billed as ‘finest’ was nothing special. I applaud the values and enthusiasm of this young vibrant company, which has a clear ethos and also a personality. I also like the focus on British produce and British companies. For £9.99 a month this would be worth a try for a serious snack-a-holic. Disclaimer: I was sent the Snackorium box to try for free. All views are my own. The Lego gingerbread man sadly didn’t come in the box! Apple rings make the world look brilliant! Nah, the tough sell is the humble apple. ‘Who fancies an apple?’ I say brightly, looking at the fruit bowl, which is overflowing with Braeburns or Coxes. Lips get turned up, heads get shaken. ‘I don’t like the pips. Have we got any strawberries, mummy?’ I remain upbeat – ‘No, no strawberries today. I’ve got lots of lovely apples though. Mmmm, jucy apples. Who wants an apple?’ No response. ‘Come on, you can have it whole!’ Tumbleweed. ‘I know, I can cut it up for you!’ A head twitches, a nostril flares, ‘No, mummy, I DON’T LIKE THEM CUT UP’ (that’s the scary three-year-old). Silence ensues. And that, dear reader, is how to pitch an apple to a child. To make apples instantly appealing, get an apple corer, remove the core, place the apple on its side, take a sharp knife, and slice into rings. Ta-da! Apple rings can be presented on plates, in bowls, worn on small fingers, stacked, repurposed as comedy spectacles (see photo) and, if you pop a suitably sized grape in the middle of the hole, rebranded as a flying saucer (!) I know, I’m a genius *takes a bow*. Or is there life beyond raisins and rice cakes? She has created a wonderful list of 50 (yes, 50!) healthy snack ideas, divided into categories e.g. fruit & veg, dairy, cereal nuts & crisps, savoury muffins. There are some splendid ideas on her easy-to-print list, which you can find here. I love the sound of stripey fruit lollipops for hot summer’s days, malt loaf, and cheese and ham muffins! This is a great starting point, as it is packed with inspiring ideas. One I’d like to add, for babies aged 9+ months, is to give them a little plastic bowl with frozen peas in – yup, straight from the freezer – and watch them practising their pincer grip as they pop them in their mouth, and get a cold surprise! * In actual fact, I asked her nicely if I could reproduce it. She very kindly said yes. Gorgeous snack cup – perfect for little hands! So, this is my first ever giveaway, and I wanted to give away something that I really love and that I actually use myself with my kids. This Flip-Top Snack Cup is made by Oxo Tot, the makers of Oxo Good Grips. They make innovative tools and gadgets for the home, and as someone who’s a fan of tools and gadgets for the kitchen, and helping to make life easier for busy mums and dads, this is a brand that’s right up my street. Whoop! I am giving away 5 Flip-Top Snack Cups – see photo. I love the bright and funky colours, and my daughter loves the cup’s wide opening, which ensures she can reach her snacks easily. She likes her Snack Cup filled with blueberries and grapes, mini rice cakes and satsuma segments and she loves being able to open and close the lid herself. With its non-slip grips and a lid that stays attached, this is the perfect little container for toddler snacks! Please comment on this post, telling me what your little one’s favourite on-the-go snacks are. To be in with a chance of winning a Snack Cup, you have to a) follow @onehandedcook on Twitter AND b) RT my tweet about the giveaway! 27.11.12 THE ENTRY DEADLINE HAS PASSED – THANKS FOR ALL YOUR ENTRIES AND THE WINNERS WILL BE NOTIFIED SHORTLY! 2. The prize draw is open to any UK resident, aged 18 or over, who follows the @onehandedcook Twitter account AND retweets the tweet about the prize draw referencing the prize of an Oxo Tots Flip-Top Snack Cup. 3. The competition starts at 10pm UK time on Wednesday 21st November 2012 and ends at 09:00am on the 27th November 2012. 6. The prize is one Oxo Tots Flip-Top Snack Cup.